Pioneers in the industry, we offer medium duty chain pulley block -3ton, triangular chain pulley block - 5ton - super-p' model, manual chain block isi marked 10t x 6mtrs lift, powerful bemco brand - 20ton x 3mtrs manual pulley block, manual chain hoists - 15t x 3mtrs lift and isi marked model super-p' 7.5ton manual chain pulley block from India. With full leverage on extensive prowess, we are engaged in manufacturing and supplying best in class Medium Duty Chain Pulley Block. Our offered products are primarily used for carrying high loads during material handling with uttermost perfection. 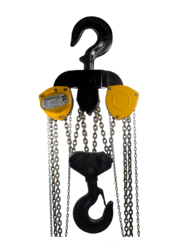 Equipped with highly robust hook and chains, these blocks possess high robustness and load carrying capacity. Apart from this, we supply our blocks under varied stipulations for serving diversified needs of customers. Additional test certificate as per factory act on form 12 or IDLR Test certificate, available on request. We have full devout in manufacturing and supplying Triangular Chain Pulley Block, which is used in various medium duty applications in industries for their features like easy to maintain, durability and flexibility. These products are also checked stringently by quality analysts to ensure that defect free range is supplied to our customers. They are well known for their high performance, robust construction and easy maintenance. We are one of the foremost organization actively engaged in manufacturing, exporting and supplying of supreme quality Manual Chain Blocks. 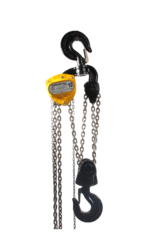 These chains are well known in the market for their superior strength and fine precision controls. 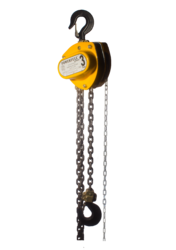 We manufacture these chains in varied specifications as per latest industrial norms. 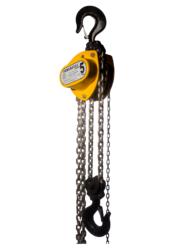 Our clients can avail from us high-quality chain blocks from a vast range of offered options based on the requirements of capacity, lifting height and application. Our Manual Pulley Block manufactured from the highest quality steel materials. Offering a lightweight, but robust, exceptionally strong product. Superior quality and performance are assured by exclusive, improved, process technology and years of experience. 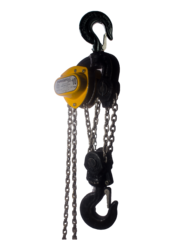 We are the leading and prominent Manufacturer and Supplier of Manual Chain Hoists - 15T x 3Mtrs Lift. 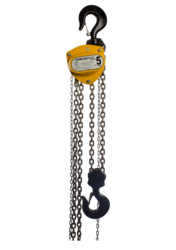 Our Manual Chain Pulley Block are considered as viable alternatives of electric hoists having identical features of hoists. These blocks are well known in the market for their superior operational efficiency and sturdy construction. Our clients can avail from us these products at most competitive rates. These chain pulley blocks are provided with free maintenance spares and also carry a 2-year warranty (ex-works). "Powerfull" bemco brand ISI marked super-p' series chain pulley block.